In September 2001 I went to investigate SH 87, the washed-out coastal highway northeast of Galveston between High Island and Sabine pass. See the report. It was one of the most fascinating road investigation trips I've ever taken. I visited both ends of the washed-out highway, but did not attempt to drive the full section. Fast forward to January 2005. 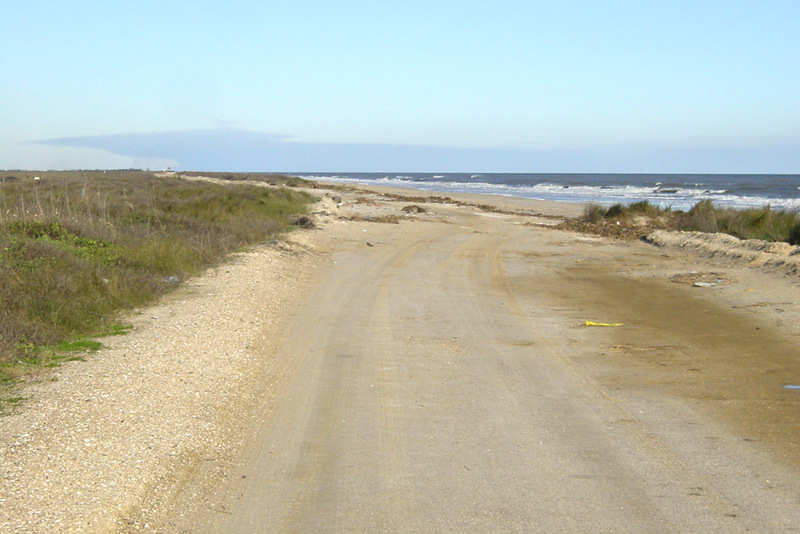 I revisit SH 87 and this time drive the full length of the former highway. We made the trip in a conventional auto (a 2004 Chevy Impala). That was definitely a risky undertaking, since there were areas where the car barely made it through the sand. An SUV would be a much better vehicle for the trip. 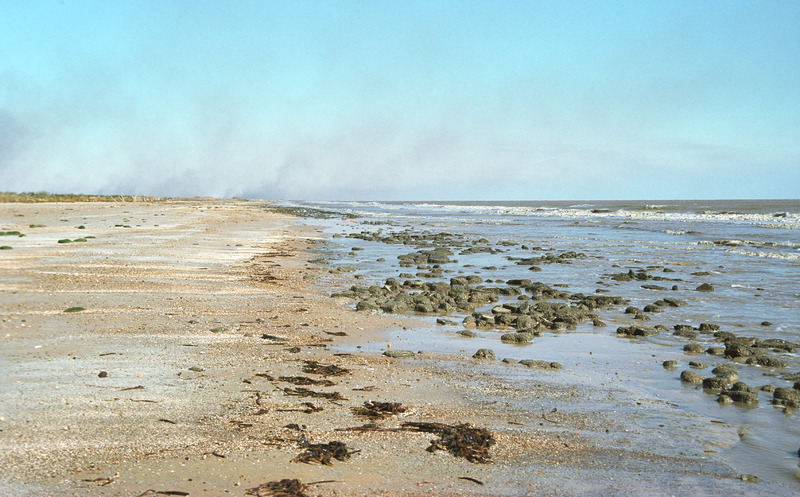 There is a makeshift vehicle path at the edge of the sand for most of the route. 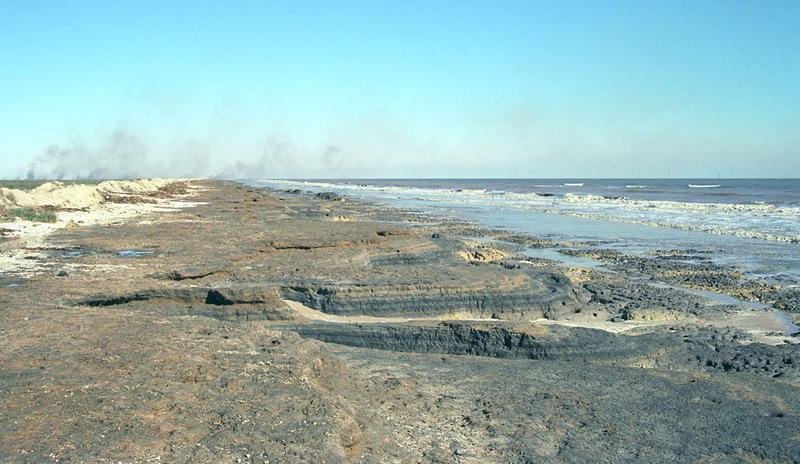 However, it is very rough and often unsuitable for regular passenger (non-SUV) vehicles. 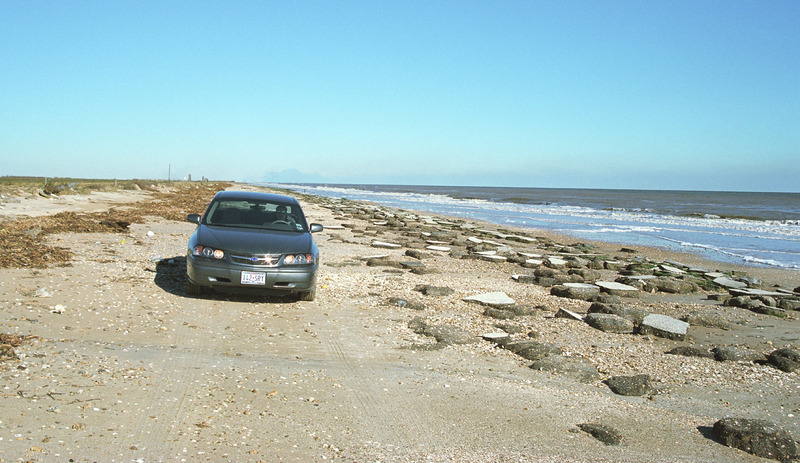 In order to get through, we had to drive on the beach in various places. There is a major asphalt debris field approximately midway along the route. Evidence of the former highway can be seen on about half of the route, but on the other half it appears to be totally gone. If you attempt this crossing, you are well-advised to be in a truck or SUV, and try only when conditions are dry. The last I heard on the subject, TxDOT has agreed to fund construction of a new highway but Jefferson County is responsible for funding the Environmental Impact Statement and getting EPA approval. 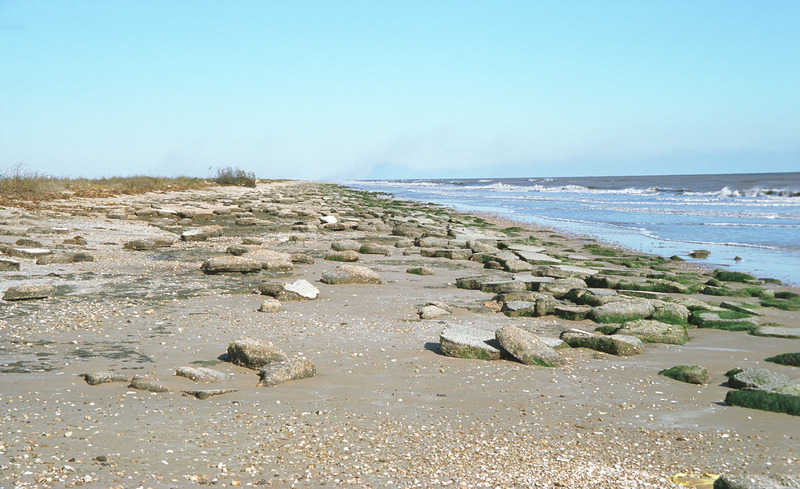 The big problem is that moving the highway inland will impact the McFaddin National Wildlife Refuge. 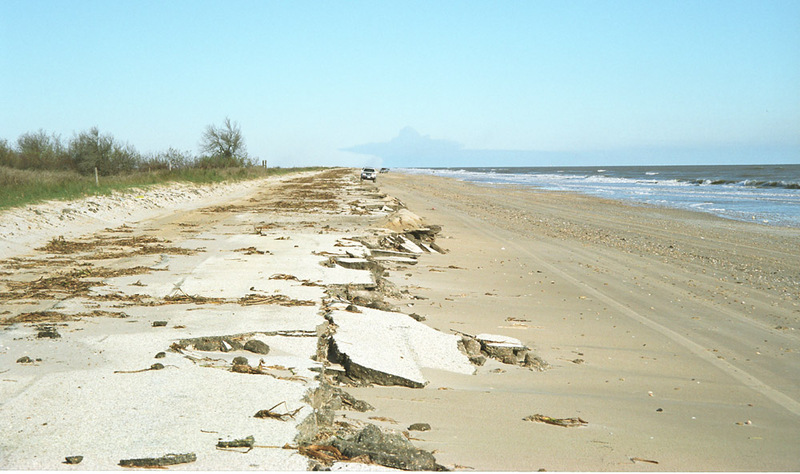 However, keeping the highway close to the Gulf will ensure a short life since erosion is steady and a big hurricane could knock out tens of yards of land in a single event. I think it is uncertain what will eventually happen, but my view is that the highway should not be rebuilt. 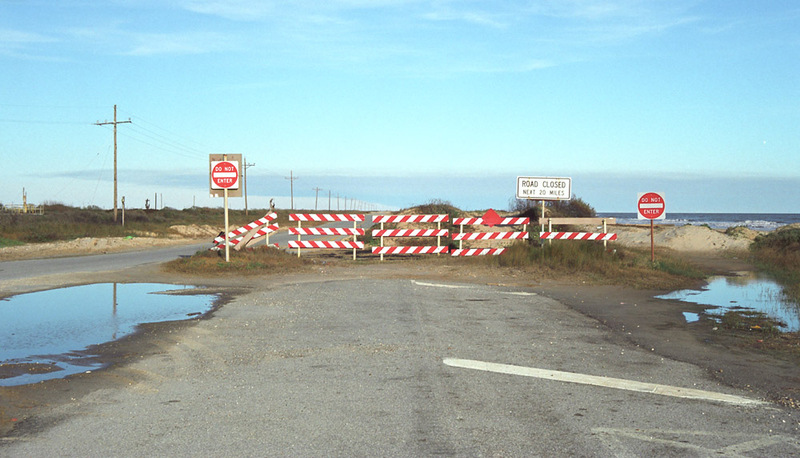 This is the barrier on SH 87 at the TX 124 intersection. Traffic is diverted north on TX 124. However, it is easy to drive around the barrier. A short distance beyond the barrier the highway starts to succumb to sand. 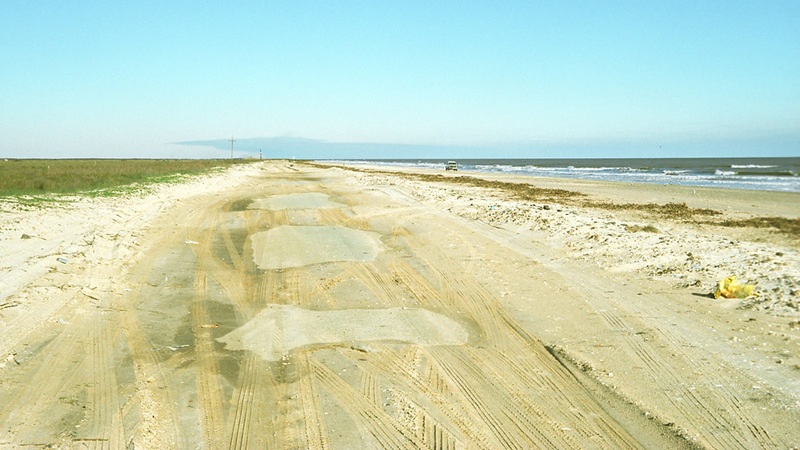 This is where the highway is overtaken by sand. 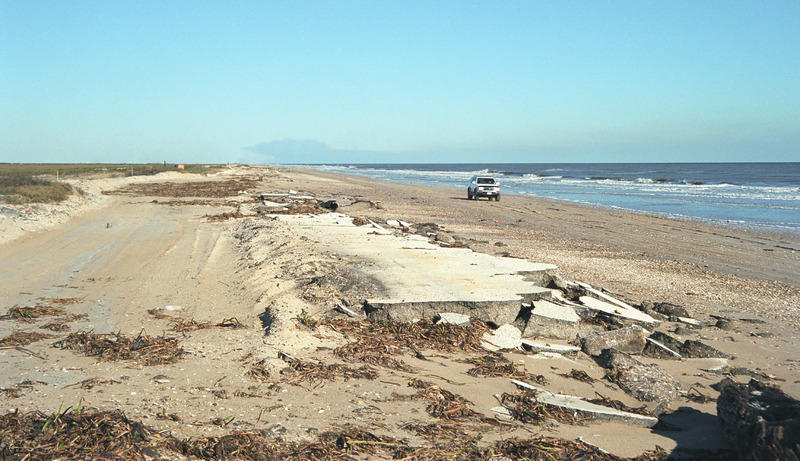 The highway is still intact below the sand, but not much is visible. 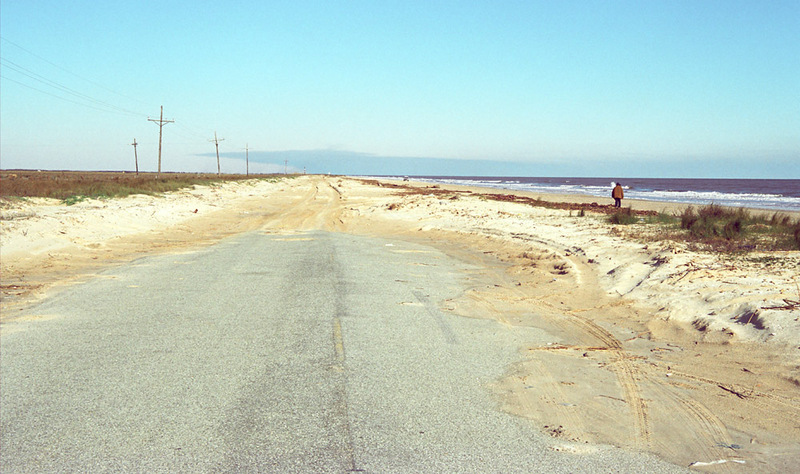 Just ahead the highway curves into the Gulf. 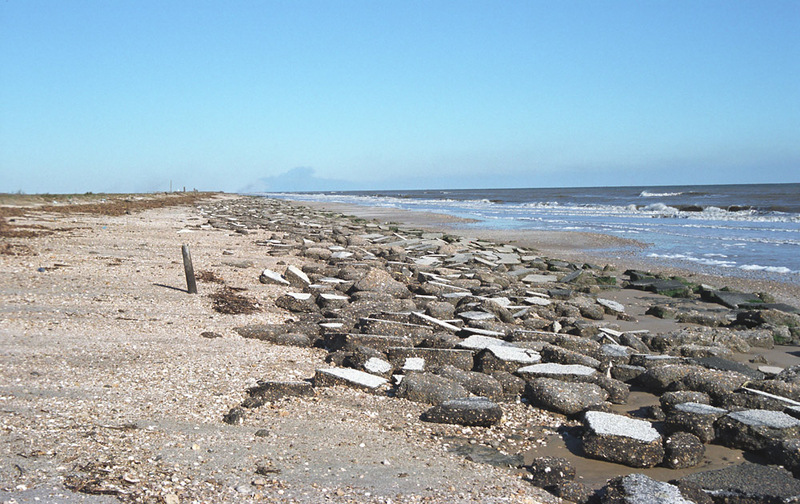 Here is where the highway starts to crumble into the Gulf. This transition looks similar to how it did in 2001. Just ahead the highway is still substantially intact. 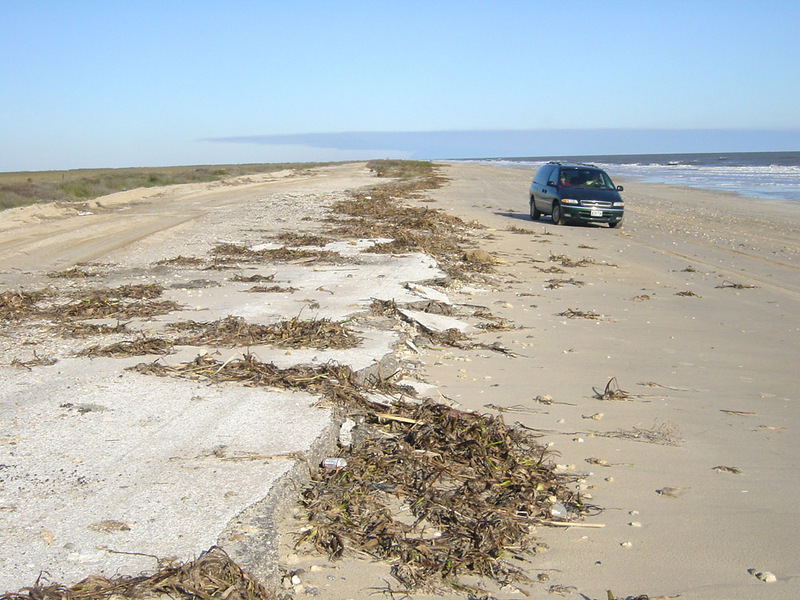 This is the last significant intact section of highway, which is less than 2 miles from High Island. 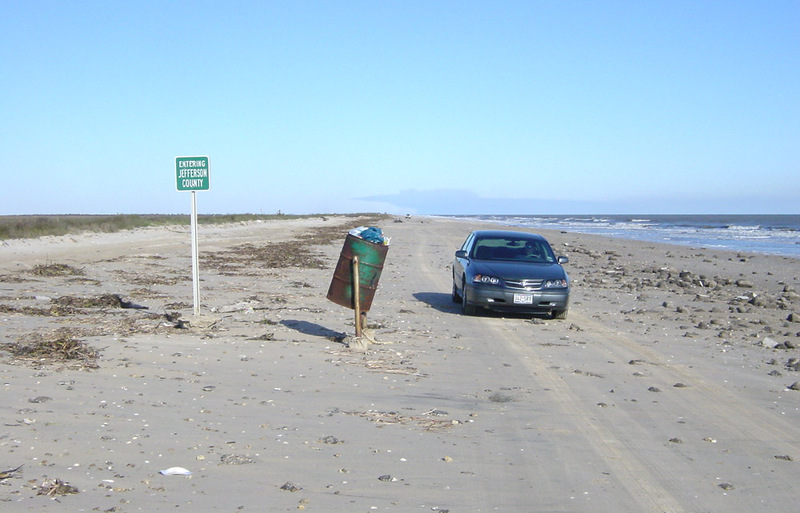 These signs indicate the entrance to the McFaddin Wildlife Refuge. 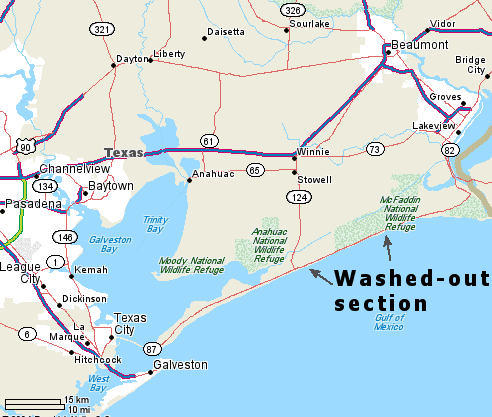 Just ahead is the Galveston-Jefferson county line. At this location there is a major asphalt debris field. We were able to get through this area by driving on the sand between the vegetation and asphalt. Here the asphalt debris is right on the water's edge. This is one of the most impressive asphalt debris fields. Further ahead, evidence of the highway is minimal - just a few asphalt chunks in the vegetation. By this time we're past halfway to the eastern stub of SH 87. 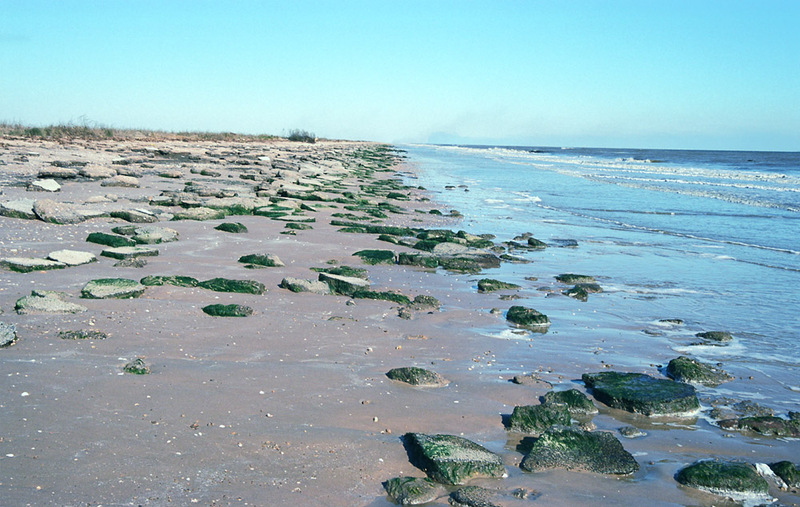 Erosion is severe in this area. 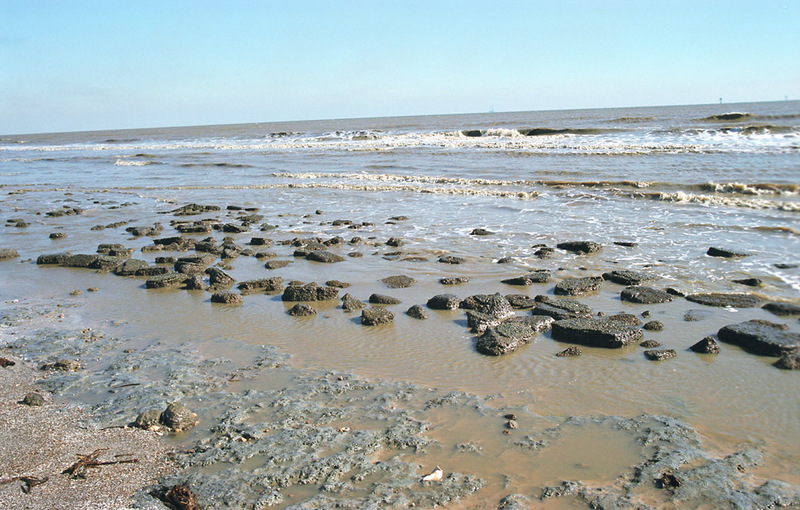 All the sand is washed away leaving these formations in the mud. We were able to drive along a makeshift vehicle path to the left of this view. In the distance we can now see the fires that are burning. 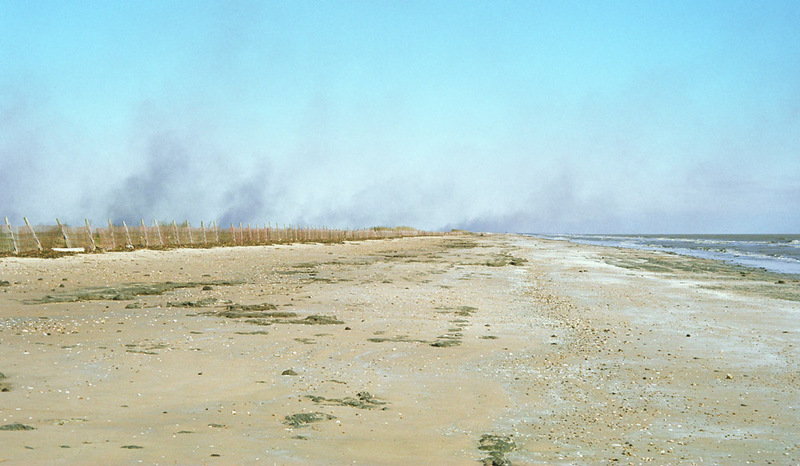 I think these were controlled brush burns. Here we can see the makeshift dirt road, which was a very good quality road compared to most of the route. 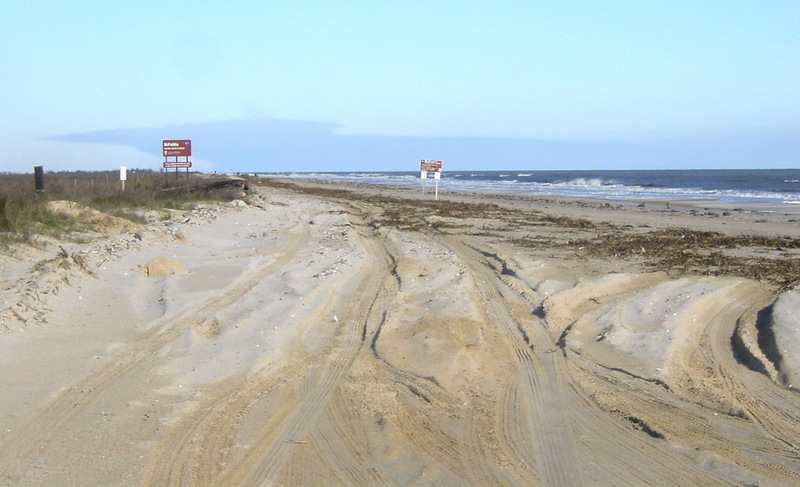 There appears to have been some heavy equipment in this area, piling up a berm between the road and the muddy coastline. 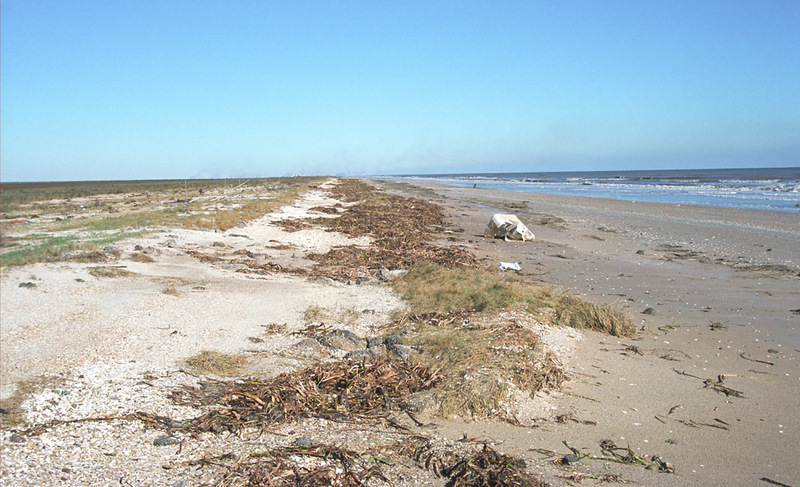 At this location the asphalt debris field re-emerges from the water, and curves out of the Gulf back to land. Here is a closer look at some of the asphalt chunks. This is one beach were you wouldn't want to swim! 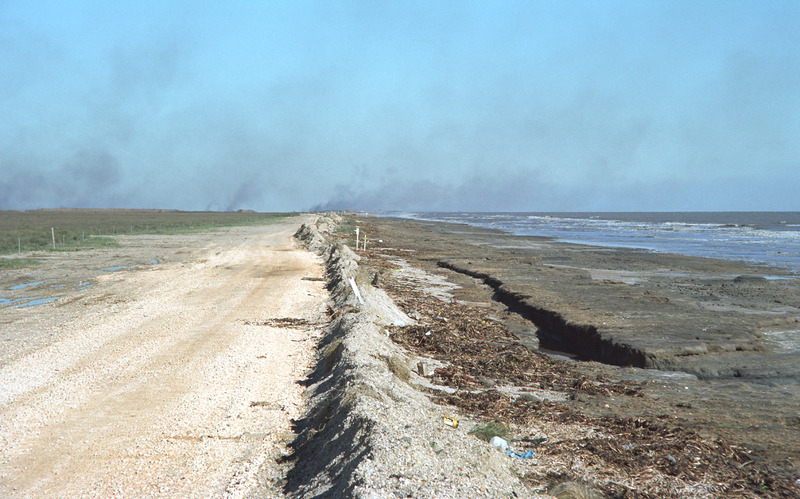 As we approach the highway section at the Sabine end, there is little evidence of the former SH 87.